Baba Ghanoush, Baba Ghannouj or Baba Ghannoug is an Arab dish of eggplant (aubergine) mashed and mixed with various seasonings. Left: Syrian style Baba Ghanoush. It is made of eggplant with finely diced onions, tomatoes, and other vegetables blended in. It is normally served with a dressing of oil and pomegranate concentrate. 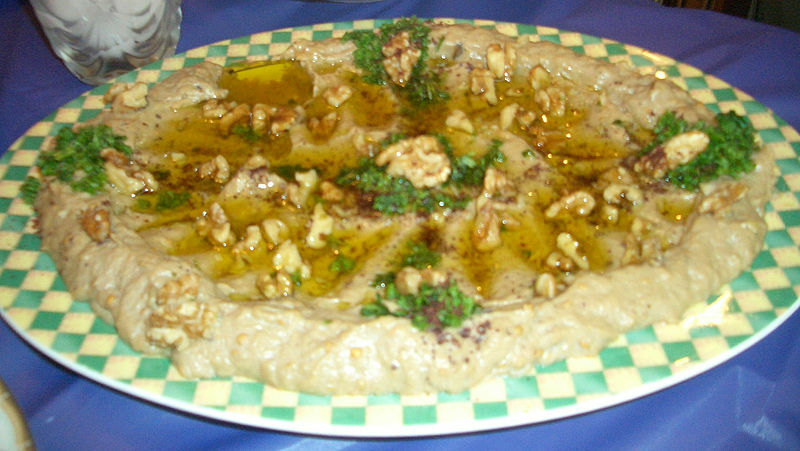 It is made of roasted, peeled, and mashed eggplant, blended with tahini, garlic, salt, and lemon juice and topped with olive oil. Cumin and chili powder can be added. In the traditional method, the eggplant is first roasted in an oven for approximately 30 minutes. The softened flesh is scooped out, squeezed to remove excess water, and is then pureed with the tahini. There are many variants of the recipe, especially the seasoning. Seasonings include garlic, lemon juice, ground cumin, salt, mint, and parsley. When served on a plate or bowl, it is traditional to drizzle the top with olive oil. A popular preparation method is for the eggplant to be baked or broiled over an open flame before peeling, so that the pulp is soft and has a smoky taste. Often, it is eaten as a dip with khubz or pita bread, and is sometimes added to other dishes. It is usually of an earthy light-brown color. It is popular in the Levant and Egypt. In some parts of the Levant, baba ghanoush is a starter or appetizer; in Egypt it is mostly served as a side-dish or salad.